For those that have already visited the Garden Isle or for those that are experienced kayakers with a sense of adventure, I would highly suggest going to one of the most beautiful beaches on Kauai, Kipu Kai. This beach, featured in the movie The Descendants, is on property of the Waterhouse Family between Poipu and Lihue. Although the surrounding land is privately owned, its two miles of beach are public. There are no scheduled tours to the beach; so, you most likely will be the only kayak on the beach. With that said, there are a couple of very important rules about Kipu Kai. Respect the land by picking up any trash. Respect that Kipu Kai is private property at the tree line of the beach. No trespassing. I have visited Kipu Kai various times since moving to Kauai in 2013. There are two routes to take to Kipu Kai: one starting at Nawiliwili Harbor in Lihue or at Maha’ulepu Beach in Poipu. Regardless of which starting point, you will want to only do this if the conditions are right. It is best to do this kayak when there are Kona winds from the South with little swell. Although you can do the route in a single kayak, I would suggest a tandem kayak for two people. It is most likely that the wind or current will be working against you on one of the legs of the adventure. And, when the forces of Mother Nature are working against you, it is best to have a PIC (Partner In Crime). As on any water adventure, you should always have a life vest when kayaking as well as someone on land that knows your plans and estimated time of return. From either direction, it will take forty-five minutes to an hour and fifteen minutes to paddle. I have witnessed humpback whales, spinner dolphins, manta rays, and numerous fish. You may see a few fisherman coming from Nawiliwili Harbor as well as kite boarders in Poipu, but you won’t find a traffic jam here like the rush hour coming from Kapa’a into Lihue or the reverse at Pau Hana (end of working day) back into Kapa’a. 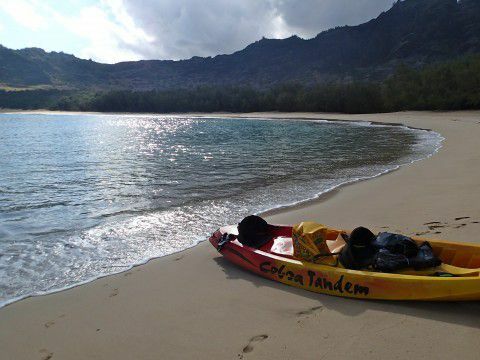 Kayaking to Kipu Kai is certainly an off-the-beaten path adventure on the water in Kauai. It is a unique, active experience with the prize, a two-mile stretch of paradise without the crowds. As always, stay up-to-date on more adventure travel stories and tips from Kauai and more destinations by connecting with me on Facebook, Twitter, Google+, and YouTube. If you are looking for a powerful story and book, check out my memoir, When All Balls Drop, and its sequel, With New Eyes (due out in September).